On Sunday I went to listen to Gill Lewis talk about her newest book, Scarlet Ibis. She managed to get us all to think our way under the skin of an animal (and to draw it, though the less said about my attempted Pine Marten, the better) and try to experience its world. I’m really looking forward to reading Scarlet Ibis. I’ve loved her other books, which combine very original stories in which wildlife and the environment play a huge part with a real emotional punch. I was lucky enough to take part in an event with Berlie Doherty on Monday. 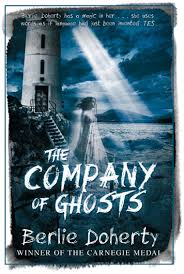 She spoke about her latest book, the atmospheric and deeply unsettling Company of Ghosts, and I talked about Beneath. Andrew Jamieson steered our conversation skilfully and the audience were great. It was a very, very nice way to finish off the Festival for this year. I’m already looking forward to next year’s!